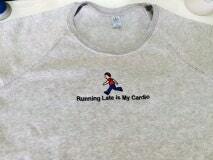 Running Late is My Cardio Emoji Sweatshirt ! Embroidered Custom Soft Heather Grey Sweatshirt. We chose the Alternative brand because it a so soft and has a bit of a scoop neck. Sizing is regular fit. I wear a size 8 and a small to medium fits just fine. We cut the sleeves to change up the look but we also offer in long sleeve. 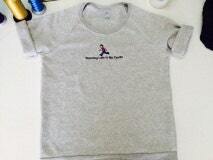 Material is cotton and polyester blend.